Norstedts doesn’t even believe that cycling is a form of riding! Åka cykel means go by bike, and applies also to being in a child seat on a bicycle, or a passenger on the crossbar or handlebars, for example (in Australia, that’s a dink, or a donkey if you’re from South Australia). Not so simple, is it? 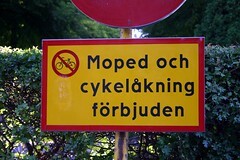 My colleague reckons it should be either Moped- och cykelåkning förbjuden (note the hyphen), or maybe Mopedåkning och cykling förbjuden. It occurred to me that in English, it’s not only the vehicle that gets driven, but also the passengers within (Drive me to the airport, cabbie!). I wonder if the same is true in Swedish? This sign is on the ceiling just outside my office door. 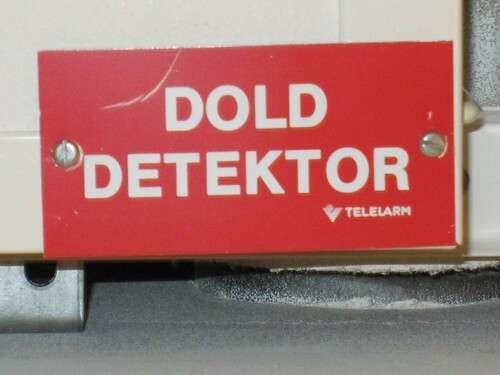 I wondered what is the dold that this detektor is hoping to detect – smoke, fire, radiation perhaps? How would a little knowledge of Swedish morphology have helped me out here?